Cynthia May Pearce was born in the 2nd quarter of 1909, Swindon, Wiltshire England. Church of the Holy Cross, Chiseldon, Baptism Register 1909, Baptism No. 689, 13th June 1909, Cynthia May Pearce, daughter of William and Annie Maria Pearce. At the time of the taking of the 1911 Census of England and Wales, William Pearce (Police Constable), his wife Annie and daughter Cynthia were residing at the Malmesbury Police Station, Wiltshire, England. William Pearce (Police Constable), Wife Annie and daughter Cynthia were residing at Police Station Malmisbury, Wiltshire, England at the time of the taking of the Census. The Pearce family address is listed as 195 Redbourne Road on Cynthia's Enrollment at Jennings Street School, Swindon, Wiltshire, England. Cynthia May Pearce was enrolled at the Jennings Street School, Swindon Wiltshire, England on 21st September 1914, till 6 November 1914 (Left Town) Admission No. 1394. Her previous school was listed as 3.5 yrs at Brinkworth. Cynthia May Pearce enrolled at Jennings Street School Swindon, Admission Number 1394, on 21 Sep 1914. Cynthia May Pearce was employed as a Clerk with the Great Western Railway, Swindon C.M.E's Office, Engine Statistics office from 26th January 1927 until leaving on 12 Mar 1932. Cynthia May Pearce was employed by the Great Western Railway, Swindon, engine Statistics Office as a Clerk from 25 Jan 1927 until 12 Mar 1932. Cynthia May Smith died and her death was registered in the 2nd Quarter of 1991 at Chippenham, Wiltshire, England. [S346] England and Wales Births 1837 - 2006, Find My Past (Reliability: 3), 1909. [S392] National School Admission Registers & Log-Books 1870-1914, findmypast (Reliability: 3), 21 Sep 1914. See attached National School Admission Register for Cynthia May Pearce. [S464] Wiltshire Baptisms 1530-1917, findmypast, 87 (Reliability: 3), 13 Jun 1909. 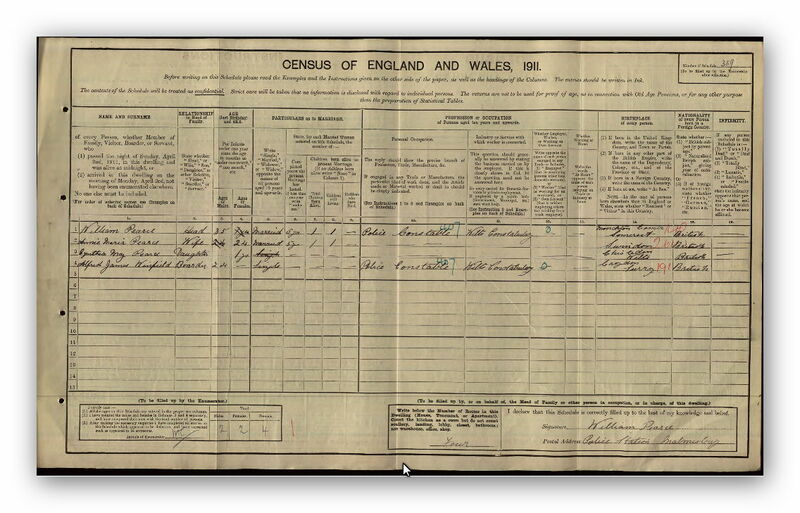 See attached 1911census of England and Wales document. [S392] National School Admission Registers & Log-Books 1870-1914, findmypast, Archive Ref F8/600/263/7/6/1 (Reliability: 3), 1914. See attached National School Admission Register - Swindon, Jennings Street School, Wiltshire, England, Cynthia May Pearce. [S380] The National Archives of Great Britain, 28 (Reliability: 3), 25 Jan 1927. Cynthia May Pearce was employ in the Engine Statistic Office of the GWR Swindon from 25 Jan 1927 until 12 mar 1932 see attached employment record. [S397] England and Wales Deaths 1837 - 2007, Vol 23, Page 1850 (Reliability: 3), 1991. Cynthia May Smith (n. Pearce) died 1991 and her death was registered 2nd Quarter 1991 at Chippenham, Wiltshire, England, Vol 23, page 1850. [S520] Haycombe, Cemetery Crematorium Records, Somerset, England, Haycombe Cemetery and Crematorium, Whiteway Road, Bath, Somerset, England, Cremation No. 73012/30May1991, 30 May 1991.